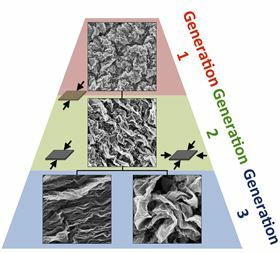 Multiple generations of hierarchical graphene oxide architectures emerge from sequences of extreme wrinkling or crumpling. As shown in this genealogy, each new deformation results in a progressively larger set of features decorated by smaller preexisting patterns. Scientists from Brown University in the US have produced wrinkled and crumpled sheets of graphene that enhance some of the nanomaterial’s many useful properties. Building on their work on wrinkles in graphene producing substrates for culturing cells in complex environments, they were inspired by the intricate patterns of wrinkles found in natural and man-made materials to develop complex, higher-generational structures incorporating both wrinkles and crumples. Graphene compressed in this way could be used in stretchable electronics, batteries, fuel cells and water resistant coatings due to improved electrochemical properties. For this study, as reported in Advanced Materials [Chen et al. Adv. Mater. (2016) DOI: 10.1002/adma.201506194], the team demonstrated that when graphene was wrinkled and crumpled in a multi-step process, it also became substantially better at repelling water, a characteristic important for self-cleaning surfaces, for example. To achieve this, they deposited layers of graphene oxide onto polymer membranes that shrink when heated. On shrinking, the graphene on top becomes compressed, resulting in it wrinkling and crumpling. Graphene sheets were also compressed many times to assess the type of structures they could create. On the first shrink, the film was dissolved away, and the graphene was put into a new film to then be shrunk again. They tried a range of configurations in successive generations of shrinking, such as clamping opposite ends of the films, causing them to shrink only along one axis. Clamped films provided periodic, parallel wrinkles across the graphene’s surface, while unclamped films shrank in two dimensions, length and width, offering a surface that was crumpled in random shapes. Rotating graphene in different configurations between shrinkings was also demonstrated to significantly compress the sheets, ending up with sheets of around one-fortieth of their original size, and that successive generations offered surface patterns such as wrinkles and crumples superimposed onto each other, of especial relevance for electrochemical electrodes that need large interfacial surface areas for energy storage, catalysis and sensing. As team leader Po-Yen Chen said “It is shown that these multiscale architectures are superhydrophobic and display excellent functionality as electrochemical electrodes”. Every deformation results in a progressively larger set of features decorated by smaller pre-existing patterns, indicating a structural “memory”. This “memory” could be programmed into unique structural architectures based on a given sequence of mechanical deformations, allowing for a taxonomy of structures developed from the various configurations. With an ever-increasing amount of 2D nanomaterials and combinations of materials with interesting chemical and physical properties emerging, the researchers are now looking at how these could be patterned and combined for new material structures and functionalities.